***SOLD OUT**** NO LONGER IN STOCK. 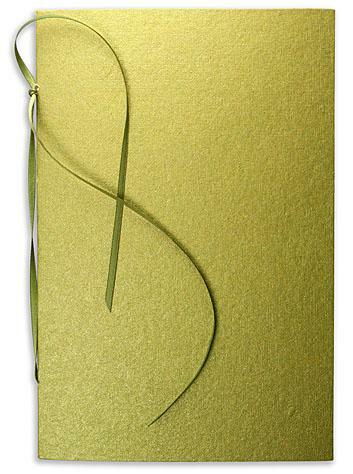 Antique Gold Wide Ceremony Program with Moss Green undertones. Booklet style wedding program. Cover made from heavyweight antique gold colored pearlescent cotton rag paper. (scored and diecut for easy folding and assembly). Bound with a length of lustrous, thin satin moss green ribbon. We allocate 1 yard (36 inches) of ribbon per program.